This soothing nappy cream forms a protective barrier against diaper contents, preventing irritation & discomfort that your baby may experience with continued use of diapers. This all-natural soothing diaper cream is made with a super-hydrating trio of Olive, Sweet Almond & Sesame oils. Sesame seed oil forms a protective coating on the skin, healing rashes and blocking the dampness that is one of the major causes for a nappy rash. Almond and Olive oils soothe and protect the delicate skin from dryness and irritation. 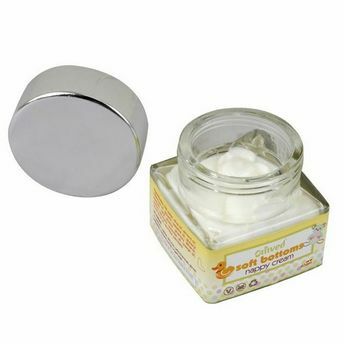 This nappy cream is also packed with the goodness of pure Calendula oil that is known for its natural healing properties to soothe baby's irritated and inflamed skin. Fragranced with a subtle aroma of peace inducing Lavender, fresh Orange and soothing Chamomille, the Soft Bottoms Nappy Cream will keep your baby's little bottoms soft & kissable. Gentle enough for even the most tender of newborn bottoms. What goes on your baby goes in your baby. An adult's skin absorbs approximately 70% of what you apply on it and since a baby's skin is even thinnner, it absorbs almost 90% of all that is applied on it. The Omved Little One collection of skincare products are formulated with the highest quality natural raw materials cold-pressed (meaning no solvents were used for their extraction) vegan oils rich in essential minerals and highly prized therapeutic grade essential oils, traditional Ayurvedic botanical extracts in a skin and earth friendly natural base. They are pure and mild, gently fragranced, and safe for the tenderest of newborn skin. Explore the entire range of Rash Creams available on Nykaa. Shop more Omved products here.You can browse through the complete world of Omved Rash Creams .